I’ve received ThL W200, a smartphone powered by Mediatek MT6589T SoC, at the beginning of week (Check specs and unboxing pictures), and after about a week of use, it’s time for a review. First I’ll go through my first impressions, test of different features such as the camera, GPS, and Bluetooth, and finally run some apps to get system information and benchmarks for this phone. This smartphone feels very light, but the build quality is good, and as explained in my unboxing post, comes with power, volume -/+, and menu/home/back buttons. You’ll also find rear camera + flash, front camera, the light sensor, and the notification light. 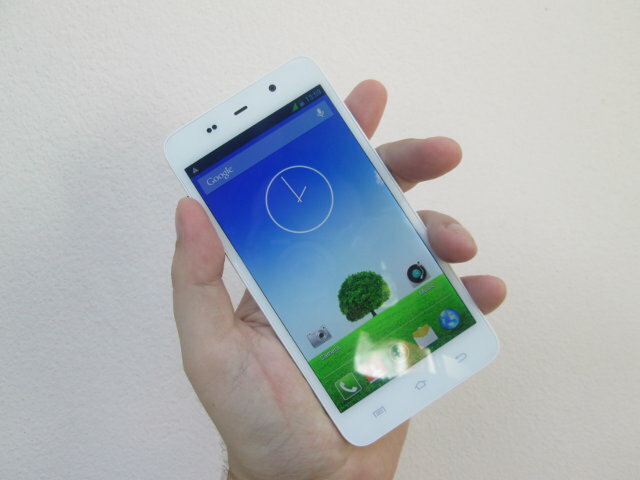 The phone boots to the standard Android home screen, as shown above, with English as the default language, and comes with Google Play Store, and no Chinese apps. The 720p screen provide a sharp and clear display, and I’m pretty happy about this part. 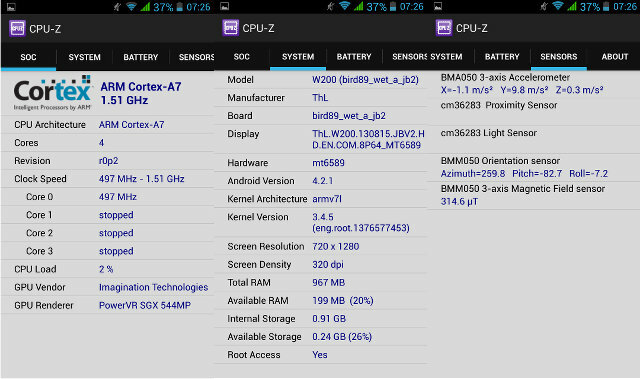 Unsurprisingly, Android is very smooth and fast in this quad core smartphone. I had no problem installing and running over 30 applications including the benchmarks (Antutu, quadrant, vellamo, …), social apps (Facebook, twitter, line…), games (Subway Surfers, Candy Crush, Raging Thunder 2), and diverse other apps including YouTube and Firefox. The only app which crashes from time to time is Nike+ Running, but only at the very start of a run. I could not pair the phone from Ubuntu 13.10. Ubuntu’s Bluetooth Manager could find the device, and ask me to confirm the pin was correct, but nothing showed on the phone. I could successfully pair the computer from the phone however. Finally, I could send files (around around 100 to 150 kB/s), but not browse the phone from my Ubuntu PC. I finally unable to find a quick way to confirm the Bluetooth version, although it should be possible to install hciconfig / hcitool to get more info. DealExtreme says it’s Bluetooth 4.0, but others mention Bluetooth 2.1 instead. The file transfer speed above also confirms EDR is supported. Initially, I could get my location pretty fast in Google Maps, but the app used mobile network location techniques, and GPS was not used. This is only when I started to use Nike+ Running that I discovered there was a serious problem with GPS, as it was unable to lock GPS after over 10 minutes outdoor in the countryside. It turns out mediatek GPS is just fine, but somehow the end users have to configure this manually, and/or run some third party apps to configure GPS in an optimal manner. I wrote instructions to configure Mediatek GPS for a much faster lock. Please also make sure to read insightful comments in the linked post. Once GPS is configured properly, apps could lock GPS within 5 to 10 seconds, although in some instances in may take around one minute. By default, GPS is really poor in this phone, and apparently in all Mediatek phone, but once you’ve configured it correctly, it works just fine. This is quite silly from Mediatek, not to provide optimal settings, or at least an app to help users configure GPS. In good light conditions, the rear camera takes decent photos, but in most cases the shots will be somewhat disappointing. Close ups are often blurry, and I’ve taken two red / orange flowers photos where details are lost and colors seem unnatural. For testing purpose, I used the default “Normal” mode in the camera app, and better photos may be obtained with other settings. The front camera quality is pretty decent for what it’s supposed to do. Close face shot. I haven’t tried video conference via Skype or Google Hangout. I haven’t made any standard call, but did a test call with Line, and audio quality was decent, and sound was clear via the headphones. The provided headphones are OK, except for the lack of volume button. The rubber earbuds fit well in my ears, with the drawback that I could hear all movement of the cable while walking with low volume. The speaker is loud enough for me. That’s no surprise that I have to charge the phone everyday with the 1,750 mAh battery included. I normally enable Wi-Fi, Location services, and Sync at all times, but Bluetooth is usually turned off, and brightness set to automatic. I did not use 3G data, only Wi-Fi. With these settings, the battery won’t last 24 hours on a charge, and heavier users may have to charge the smartphone twice a day, or somehow charge and use the second battery included with the phone. It’s probably the case with most recent phones, but at no time, the phone got warm during use. I’ve also tried Miracast with MK908 mini PC using WiDisplay application that comes with the latest firmwares. The good news is that it works, and you can mirror the display. It’s convenient to show pictures but there’s clearly a hit in terms of video quality as lossless encoding artifacts are obvious. Video playback is better, but I’m usually playing YouTube videos at 360p so that may be why I’m satisfied. I’ve also tried Raging Thunder 2, a car racing game, via Miracast, and it’s unfortunately unplayable. The game is very smooth in the phone, but sometimes there will be so many frames skipped, and longish delays that I spent more time hitting the walls than on the road. I’m assuming the problem is with a poor Wi-Fi (direct) connection between the phone and MK908, even though device were less than 1 meter apart. Another annoying issue with the current firmware at least, is that the notification light simply does not work. There is a fix – which I have not tried yet – where you can to root your phone, and replace lights.default.so file. Everything is explained here. Another small annoyance, at least to me, is that the only way to wake up the phone from sleep mode is to use the power button, the home button does not work, probably because it’s not a physical button. In order to get some system information, I’ve run CPU-Z app.